The breviary gives hymns, prayers and readings, along with instructions, for the prayer services called the 'divine office' which were said several times each day. The core of the office was the Book of Psalms, which was recited in its entirety over the course of a week. 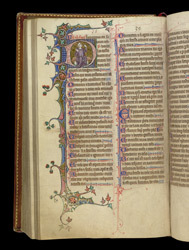 The Stowe Breviary has a copy of the psalter, which is divided into eight sections, one for each day of the week plus one for evening prayers (vespers). Psalm 38 (39) begins a section and is highlighted with a picture of a king (probably meant as David) who points to his mouth in reference to the psalm's verse ("keep my tongue from sin").